There are plenty of reasons to spruce up the lobby. 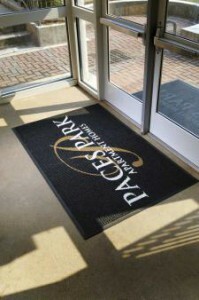 When people first enter your office, do they see a logo mat? You want visitors to see your business right when they enter, and there are a lot of benefits to having it front and center, whether indoors or outdoors. The biggest benefit of all to having a logo entrance mat is that your brand greets a visitor, employee or customer as soon as they walk in. You want to leave a lasting brand impression, so keeping the logo in different areas throughout the workplace can help reinforce your company name. The other benefit to entrance mats? They provide a line of defense against the dirt and grime tracked in from the outside. No matter what the weather, people inevitably get residue on the bottoms of their shoes. You want to have a good impression on anyone who walks through your doors, and having dirty, scuffed floors can prevent that. Instead, choose a mat with extra traction that can help wipe off shoes as a person walks through the doors. This will leave the outside residue in the lobby, away from the polished floors of your business. Related, the mat can also provide an extra level of safety, as water-absorbent options can prevent moisture from accumulating on the floor, making for a potentially dangerous situation. Many employees find that they sit at their desks for a good portion of their day, but health officials have raised concern that sitting for long periods of time can lead to health problems. Smithsonian Magazine reports that standing can reduce the risk of type 2 diabetes, obesity, cancer and long-term mortality. The news provider reports that the average worker spends nearly six hours of their day working, which is why managers are taking matters into their own hands. Many companies have begun using standing desks to provide their workers with more circulation. However, some workers may be concerned about the discomfort of standing too long. Managers should also consider placing mats under these standing desks in an effort to reduce the strain of standing for long hours on end. While people may enjoy the benefit of getting up out of their chairs, they might notice strain in their legs, lower back and heels of their feet due to standing. Business Insider reports the idea of standing desks has been around in Europe for the past few decades, but only recently caught on in the U.S. as workers make their health a higher priority. While you don’t need to spend big bucks on a treadmill desk, getting mats under the standing desks can make for a strain-free work experience.